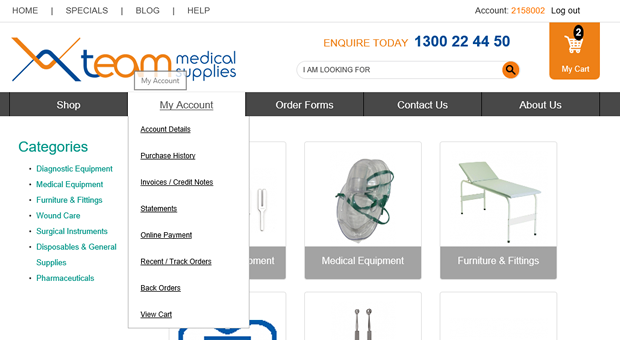 www.teammed.com.au has had some small changes made over the past week. Here is a quick guide to help make sure you find all the same feature as before. Either of these buttons will take you to the login page. Once logged in you are able to find most features with one click. You can move your cursor over a couple of options from the main menu bar. See below that when your cursor hovers over “My Account”, a drop down appears with all the features of been logged in. You will also see that your account number is present up the top right when logged in. There is now a search bar up the top that is always available for finding products from any page. This is also the same for the option “Order Forms”. If you move the cursor over “Order Forms” it will drop down with all your order forms which can then be clicked on.